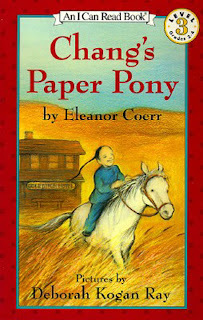 In my earlier post on good history books for the K-3 crowd, I accidentally omitted Chang's Paper Pony. It's not easy to find a book about 19th-century Chinese immigration that a 7-year-old can read by herself, so you can't ignore the few that are out there. I have found that many children's books on the subject of immigration (and slavery, Civil Rights, etc.) are what I always called "Kids' Books for Mom and Dad." You know the type — they're touching, lushly-illustrated books that look great but are never really a hit with the kids they're supposedly intended for. Mom and Dad love these books because they're works of art and have a Very Important Message, but kids rarely seek them out on their own. I'll admit — I love KBMD and will probably buy dozens for my own children someday. I love some (When Marian Sang, Pink and Say, Nettie's Trip South) and some are pretty good (Baseball Saved Us, Teammates), but they were always the last ones on the shelves in my classroom during free reading. Part of the problem is in the illustrations. Adults like black and white illustrations, but 95% of second graders find them boring. Kids LOVE photographs and colorful, dramatic illustrations. Charcoal sketches may be delicate and subtle, but the average elementary schooler will pass over that muted cover every time. Another problem is the story. Kids' Books for Mom and Dad are usually about Something Very Important and, when history is involved, tend toward the epic. They're usually decent for reading one-on-one with a child because in that situation the parent can answer every question and elaborate on every vague statement, but KBMD are generally not good for independent reading. There is too much new information, typically handled in the least specific way possible. Chang's Paper Pony is not a KBMD. It is a simple, accessible story that children can enjoy on a number of levels. On one hand, it's a story of a little boy who wants a pony. On the other, it's a jumping-off point for teachers and parents to introduce discussions about immigration, discrimination, and 19th-century America. The story is cute, but it's not the boring crap that they usually push on beginning readers, so it's great for late-blooming readers who are (understandably) bored by hundreds of books about anthropomorphic bunnies and Jimmy's new puppy. The pictures are engaging, the reading level is reasonable, and it's a serious story without getting too wrapped up in having a Very Important Message. A must-have, especially for California teachers (great for low readers in grade 4 for CA history). Super review, it looks a lovely book. I'm always on the hunt for great children's books and have recently discovered Bayard and their series of StoryBoxBooks, AdventureBoxBooks and DiscoveryBoxBooks (which is a special Olympic edition) They have work by acclaimed children's books illustrator Helen Oxenbury appearing in the Storybox series for September. In addition to this, they also have some great activities for rainy days: http://www.storyboxbooks.com/potatoprinting.php, http://www.adventureboxbooks.com/macaroni-picture-frames.php, http://www.discoveryboxbooks.com/skittles.php Enjoy!